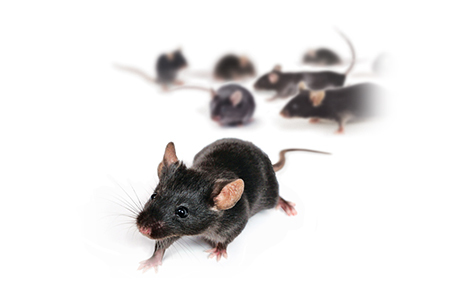 In May 2018 researchers at the University of California-Davis and Université de Strasbourg published a paper titled, A Population Study of Common Ocular Abnormalities in C57BL/6N rd8 Mice in the journal, Investigative Ophthalmology and Visual Science. C57BL/6N mice, which carry the rd8 mutation, are the most commonly used model for generation of knockout models. This study looked at a large cohort of C57BL/6N mice which were sourced from a variety of vendors and reported on the frequency of a variety of abnormalities, such as retinal dysplasia and corneal deposits. It is critical for certain research protocols to understand the incidence and extent of visual acuity problems for single-gene knockouts on the C57BL/6N background. C57BL/6N mice experience a mild form of retinal degeneration due to the Crb1rd8 (Crumbs homolog 1) mutation. There is variability in occurrence and severity of the phenotype based on model source.